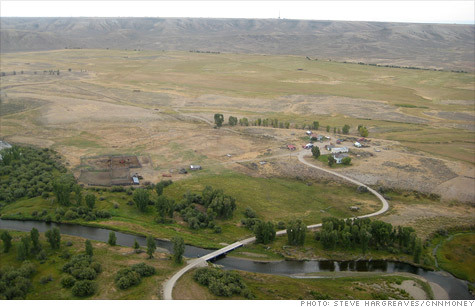 Wyoming residents have voiced concerns about the effects of natural gas "fracking". NEW YORK (CNNMoney) -- The Environmental Protection Agency said this week that chemicals from "fracking," a controversial method of extracting natural gas from the ground, have polluted groundwater in Wyoming. The findings represent the first time in the heated debate over fracking that the agency has drawn such a connection, which has long been claimed by environmental activists. In a statement released on Thursday, the EPA said a study had found that groundwater in an aquifer around Pavillion, Wyoming, contained "compounds likely associated with gas production practices, including hydraulic fracturing." Hydraulic fracturing, or fracking, is a process in which water, sand and chemicals are injected deep into the ground to crack the shale rock and unleash natural gas. The process has sparked concern in part due to worries about its effect on drinking water. The EPA constructed a pair of wells to test water quality in the Wyoming aquifer, near where natural gas firm Encana (ECA) has drilled. Within these wells, researchers found synthetic chemicals associated with the fracking process as well as high methane levels and benzene concentrations "well above" Safe Drinking Water Act standards. As a precautionary step, the Department of Health and Human Services has advised local residents to use alternative sources of water for drinking and cooking and to use ventilation when showering, in order to air out potentially dangerous chemicals. 0:00 / 3:32 Is natural gas really a clean fuel? Doug Hock a spokesman for Encana, said concerns about the pollution of drinking water "are not borne out by the facts." The EPA's test wells, he noted, were far below the depth of drinking water wells. "At a depth where you would expect to find hydrocarbons, they found hydrocarbons. In drinking wells, they found no impacts due to oil and gas," he said. "We've done extensive testing, the state has done extensive testing, and never have we found the effects of oil and gas in these drinking water wells," Hock said. The EPA, however, is worried that this may change. "Given the area's complex geology and the proximity of drinking water wells to ground water contamination, EPA is concerned about the movement of contaminants within the aquifer and the safety of drinking water wells over time," the agency said. Samples of drinking wells showed small amounts of compounds "consistent with migration from areas of gas production," it added. The EPA was careful to note that its findings "are specific to Pavillion" and are not applicable to fracking projects all over the country. Natural gas, the agency added, "plays a key role in our nation's clean energy future." In addition, the study is still preliminary at this point, subject to public comment and a peer-review process. The shale gas phenomenon has spread over the past decade from Texas, to the Southeast to, most recently, the Northeast via the giant Marcellus Shale. All the while, it has been dogged by environmental concerns. Amy Mall, a senior policy analyst at the Natural Resources Defense Council, said the EPA's report "validates things Americans all over the country have been saying for years."